During Sage Summit 2014 in Las Vegas, there was a lot of talk about Sage Data Cloud and the important role that it plays in Sage’s mobile and cloud technology vision. So we thought we’d take a closer look to help you understand what Sage Data Cloud means for your Sage 300 ERP (“Accpac”) system - today and into the future. What is Sage Data Cloud? Sage Data Cloud is technology that acts as a hub - or bridge - that connects your Sage 300 ERP system to a whole new world of mobile applications, software, and services delivered from the cloud. As seen in the diagram, it enables data and transactions to flow freely, and synchronize, between the cloud and your on-premises Sage 300 accounting system. In fact, this technology is already at work delivering some of the newer Sage Web & Mobile Applications like Sage Mobile Sales, Mobile Service, Online Billing and Payment, and Sage Inventory Advisor. This library of new and innovative add-on applications will grow as Sage continues to leverage the Sage Data Cloud platform. For some companies, choosing between the cloud and an on-premises installation is an either/or decision. But not everyone is sold on trusting ALL of their critical financial and operational data to a cloud vendor for safe keeping. With Sage Data Cloud, you don’t have to choose because you get the best of both worlds. Sage describes it as a “Hybrid Cloud” which means that you have some data on-premises (on YOUR server) and some data in the cloud. Sage Data Cloud also preserves your existing investment in Sage 300 ERP while at the same time extending available features and functionality through web-based cloud applications. You get the flexibility and ease-of-access (anywhere and on any device) that the cloud offers while preserving your existing workflow, investment in training, and any customizations you’ve applied to your on-premises installation. 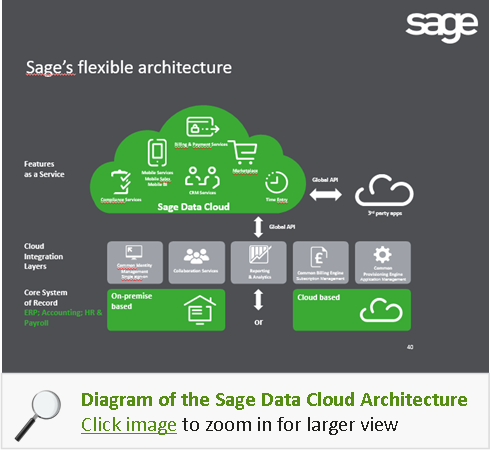 Visit the Sage Data Cloud website to learn more or contact us with your questions.